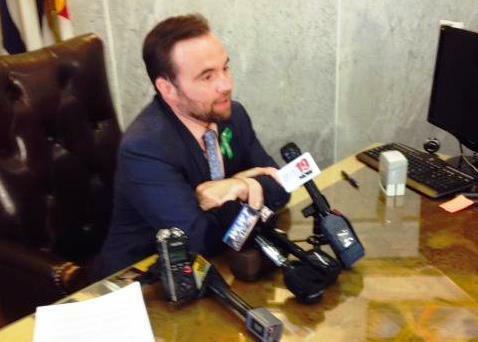 Cincinnati Mayor John Cranley explains his veto decision. Five council Democrats voted to approve the plan to charge Over-the-Rhine residents $108 a month for 450 parking spaces. It would take six votes to override Cranley's veto, the first he has issued in 17 months in office. Cranley had preferred a plan that would allow the city manager to set the price and number of parking spaces, but that ordinance failed in a council committee Monday. The mayor had argued previously that Over-the-Rhine residents should pay more to pay for the streetcar, which has a projected $200,000 deficit in its operating fund. In a press conference in his city hall office after the council session, Cranley said he believes that limiting those parking spaces to residents would be unfair to people who visit the neighborhood's restaurants and attractions – and to city residents in general, who pay taxes to maintain the streets in Over-the-Rhine. Vice Mayor David Mann said the plan made sense for neighborhood residents. Cranley, in vetoing the legislation, bucked his five fellow Democrats – Mann, Chris Seelbach, Yvette Simpson, Wendell Young and P.G. Sittenfeld. The council members who voted against the ordinance were Republicans Charlie Winburn and Amy Murray, along with independent Christopher Smitherman and Charterite Kevin Flynn. “The last time I checked, we wanted Over-the-Rhine to be a residential area, not just a place people visit and leave,’’ Simpson said. Cranley said his decision to veto the ordinance was influenced by a letter from the Downtown Residents Council saying that their residents should have the same option for an annual parking fee of $108 being offered to Over-the-Rhine residents.